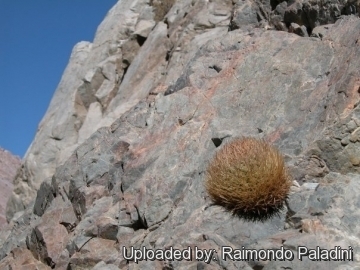 Growing habit at Balalà, Elqui valley, Coquimbo Region IV, Chile. Origin and Habitat: Chile Coquimbo and Atacama regions. 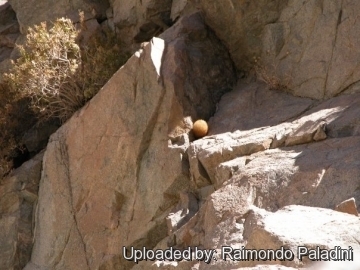 Low Andes mountain on the north and south Of Río Elqui Valley down to near the ocean cost. 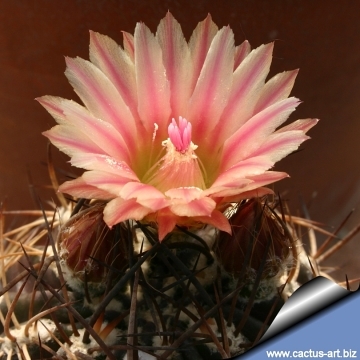 Description: Eriosyce kunzei, (syn: Eriosyce eriosyzoides), is a spherical to columnar, perennial cactus up to 20 cm tall and 14 cm in diameter. 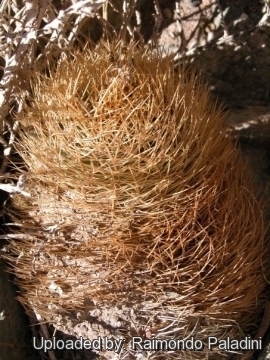 Long, thin, yellow or grey spines curved upwards and inward completely encircle a green stem. Plants are usually solitary. During spring or autumn the crown produces broadly funnelform flowers up to 3-5 cm long, ivory white, with a reddish mid-strip, and open only at the tips. It is also highly variable in appearance. In fact, there are a number of different looking forms, so that only some authorities recognize the different populations as segregate varieties. Two varieties are recognized, the nominate form ( var. kunzei) and var. transitensis. Derivation of specific name: This member of the Cactaceae family was given this name in honor of the German physician and botanist Gustav Kunze. Stem: Globose or flattened to cylindrical, 10-20 cm tall, 13-14 cm in diameter. 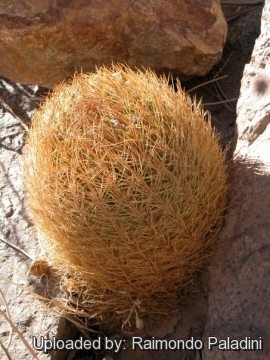 The apex is depressed and often deprived of spines, but spines covering the stems. Epidermis green or blue-green, rarely tan-green to dark violet-green . Ribs: 13 to 20 cm, about 7 to12 mm tall in adult specimens, 13-17 mm apart, obtuse, enlarged at areoles and tubercled. Spines: Strong, stiff and curved upwards and inward, pale yellowish to straw yellow (rarely brownish or blackish) later grey. The var. 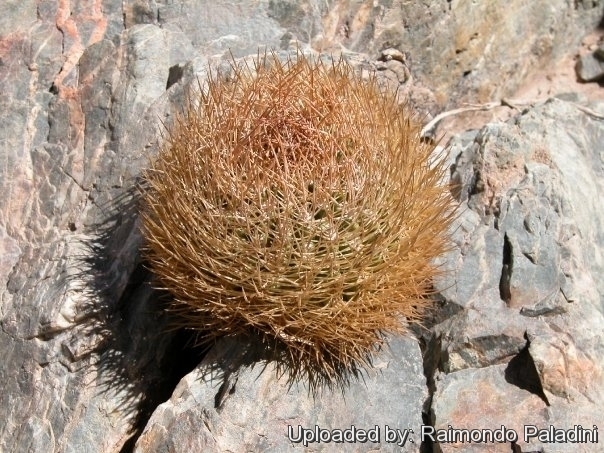 kunzei is described with very thin, needle-shaped spines but it grows and merges with the thick spined form (var. transitensis). And in cultivation it is possible to find both thick and thin spined specimens. Central spines: (1-)2-4(-7), thicker, 20-50 mm long with a darker tip. Radial spines: 10-12(-15) about 13-45 mm long straighter, mostly directed downward, the upper of them are longer than other. Flowers: Broadly funnelform, widely opened, up to 3,5 cm long and in diameter. Sepalois tepals ivory white, with a reddish mid-strip; petaloid tepals whitish yellow with a darker reddish mid-line, tips serrated or fringed. Flower tube woolly white with some black bristles. Perikarpell glossy green covered with brownish reddish scales. Stamens whitish, greenish-white or pinkish; anthers creamy white. Style flesh coloured and stigma lobes somewhat brighter. Fruits: About 2 cm long and 1,5 cm oval, fleshy, hollow, dull-green, tan, to reddish that opens at maturity by a basal pore.